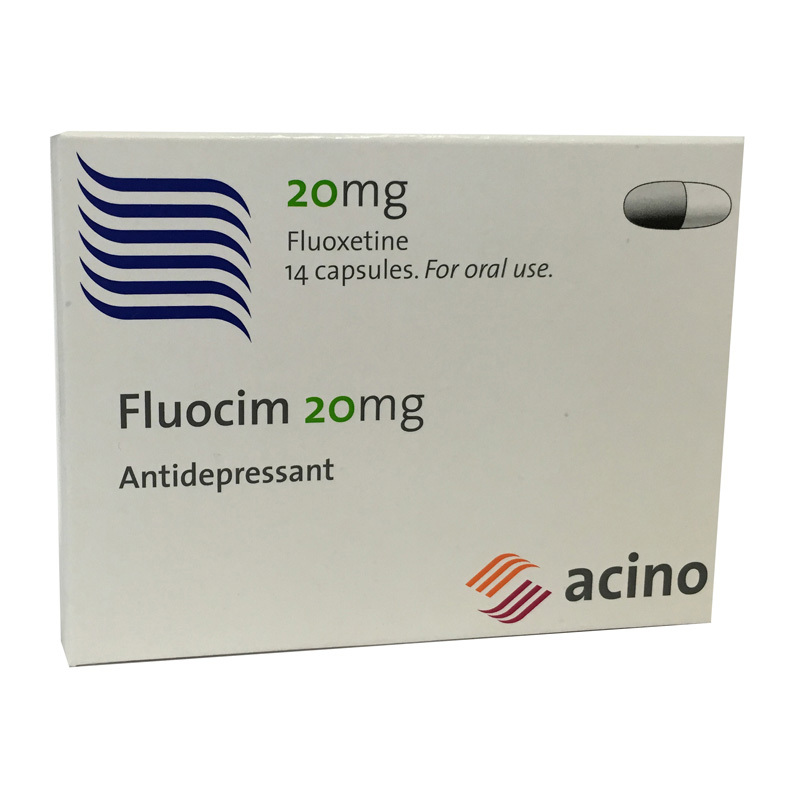 Each capsule contains: Fluoxetine HCI equivalent to Fluoxetine: 20 mg.
Fluocim acts on the central nervous system. It is used to treat severe depression resulting from a variety of causes. Fluocim is also effective for disturbed eating behaviour (bulimia). Hypersensitivity to the active ingredient Fluoxetine or to a additive present in Fluocim. In conditions where the mood is abnormally elevated, called acute manic states, treatment with Fluocim, as with other antidepressants, should not be initiated. Since there is insufficient experience of treatment of children and adolescents below 18 years of age with Fluocim, this is not recommended. In diabetics, Fluoxetine therapy may make it necessary to adjust the dose of insulin and/or the oral antidiabetic. Diabetics should therefore speak to their doctor about Fluocim therapy. Signs of side effects or the start of pregnancy should be reported to the doctor. During treatment with Fluocim, intake of alcohol must be avoided. Certain medicines (MAOI) must not be taken at the same times as Fluocim. A sufficient time must be allowed to elapse on changing from one of these medicines to the other. This change must take place under careful medical supervision. Although there have been no reports of slowing of the speed of reactions due to Fluocim, care is necessary when operating machinery and driving motor vehicles. Side effects occurring at the start of the treatment usually disappear again as treatment continues. The following side effects may occur: Sleepiness, headaches, nervousness, sleep disturbances, tremor, drowsiness, anxiety, unusual dreams agitation, hallucinations, reduced ability to concentrate, dizziness, dry mouth, episodes of sweating, blurred vision, urination disturbances; nausea, stomach/bowel symptoms (constipation, vomiting, diarrhoea), breathing difficulties, reduced appetite, sensation of fullness, taste disturbances; fatigue, weakness, muscle pain, reduction in libido, hair loss, itching. A slight loss of weight frequently accompanies treatment with Fluocim. Very rare occurrences have been disturbances of heart rhythm, psychosis, involuntary movement disturbances or inflammation of veins. Skin rashes may occasionally occur and may very rarely be accompanied by joint pain and fever. Severe influenza-like conditions with muscle pain have been observed very rarely. Patients with skin rashes have very rarely experienced serious circulatory impairments probably connected with inflammation of vessels. In rare cases there may be disturbances of the fluid and salt balance, e.g. with confusion, convulsions, oedema (swelling resulting from collection of watery fluid in tissues, e.g. the skin and mucous membranes). Hypersensitivity reactions occur very rarely. These take the form of, for example, itching skin rash, nettle rash, asthma, allergic swelling of skin and mucous membranes. Changes in the blood and liver function may occur. Cramp-like states and movement disorders may occur. The recommended dosage comprises 1 capsule a day, preferably in the morning. The medicine can be taken with a meal. If necessary, the doctor may increase the dose stepwise after a few weeks. The maximum dose at any time is, however, 4 capsules of Fluocim a day. If more than 1 capsule is taken a day, the dosage should be distributed over the day (in the morning and evening). The doctor may also prescribe another way of taking the drug (e.g. only every other day). The recommended dose for disturbed eating behaviour is 3 capsules a day. Elderly patients and patients whose weight is lower should not take more than 3 capsules of Fluocim a day. The doctor will likewise alter the dosage for patients with impaired kidney function or disturbances of liver function. Symptoms: Vomiting, dizziness, nausea, convulsions, palpitations, restlessness, agitation. Treatment: Gastric lavage or active carbon together with sorbitol. The effect can become evident within 7 days. The full effect appears after treatment for 2-4 weeks.